Teacher poems of appreciation. Teacher Day poems to thank teachers for all they've done. Teacher wishes for rewards and happiness. Preschool, kindergarten, retirement teacher poems and a teacher prayer. This short Teacher Day poem is full of admiration. It's a rhyming poem. There are lots of requests for thank you teacher poems, so here's a free verse teacher thank you poem. Poems for teachers can compare teacher to a force of nature, as this thank you teacher poem does. This poem for teacher is one of my best Teacher Day poems. 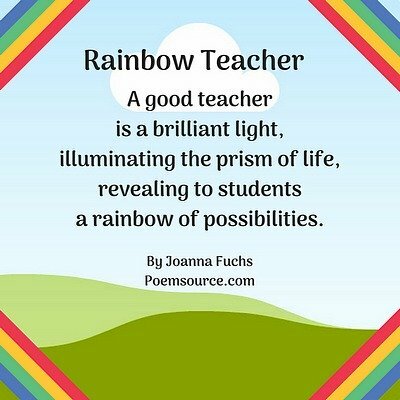 Looking for an inspirational teacher poem? This might be the one. There is a Sunday School teacher appreciation poem on the Christian poems page. There is a Christmas poem for a teacher on the Christmas poems page. This Teacher Day poem credits teacher with looking further than just the surface in this student. before I can see it myself. Teacher poems can be rhyming poems or free verse, as this teacher appreciation poem is. This thank you teacher poem can be used by students or administrators. To make this Teacher Day poem usable by a principal or administrator, change it to say, "I'd show you the positive effect you have had on this school." This is an inspirational teacher poem. This teacher appreciation poem has a casual, breezy tone that may appeal to many. You help me learn, and you're so cool. I'll remember you, wherever I go. Looking for a thank you teacher poem? This sonnet is a teacher poem for older students and adults to give to their teachers or professors. Put this inspirational teacher poem on a classy looking card. It's a teacher appreciation poem certain to make an impact. It's one of my best poems for teachers. This teacher appreciation poem says it all. Your teacher would love getting this teacher poem attached to a gift. She'd be just like you! This Teacher Day poem expresses admiration and respect for teacher. Should be a good guide, not a preacher. Encouragement would be her best feature. You inspire each brain to explore. As no teacher has before. Teacher appreciation poems are very popular. This poem for teacher, in free verse, is an inspirational teacher poem and a thank you teacher poem. Poems for teachers should make the teacher feel good. This Teacher Day poem in free verse lets the teacher know how special he or she is. I can use all my life. Teacher poems can talk about different kinds of teachers. We've all had teachers we remember all our lives, the star teachers. This teacher appreciation poem is for that kind of teacher. A rhyming poem like this is a great poem for teacher! And as a teacher, you're a star! Here's a short teacher appreciation poem, in free verse, perfect for a card or gift tag. Here's a poem about teachers that emphasizes how inspirational a good teacher can be in a student's life. It's a thank you teacher poem sure to make your teacher feel good. through which we view the world. determines how we live our lives. and make them easy to understand. a joy that enriches all we do. You are one of those teachers. This short thank you teacher poem sums up the lifetime value of a teacher. Poems for teachers are often filled with gratitude, as this short thank you teacher poem is. I'd come to school and lose my frown. With you, I learned; You helped me grow. In my life, one of them is you. Because of you, I got some smarts. Thank you, Teacher, from my heart of hearts. Inspirational poems for teachers are in demand. 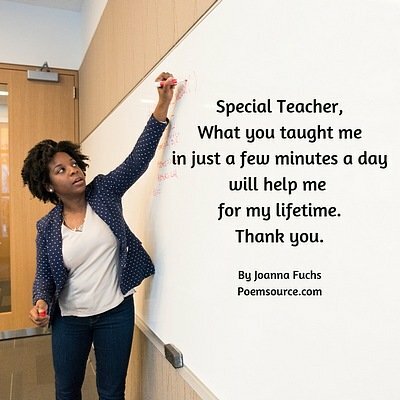 This thank you teacher poem is perfect for Teacher Day. 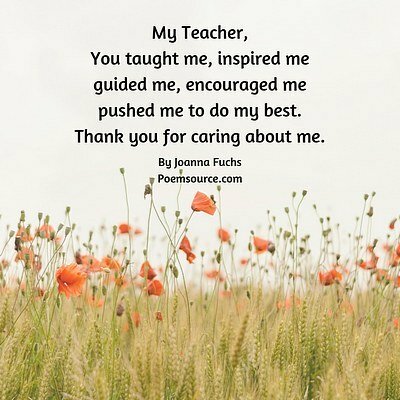 This favorite teacher poem is a teacher appreciation poem sure to please. Rhyming poems for teachers, like this one, are especially popular. Teacher Day poems often address the lasting impact a teacher has on a student's life, as this short teacher poem in free verse does. Short poems for teachers can say a lot, like this inspirational teacher poem. This short teacher poem is perfect for a Teacher Day card. pushed me to do my best. Short poems for teachers fit nicely in a card. Teacher Day poems should reveal your feelings. Let your teacher know all the ways he or she has enriched your life with these teacher poems. Your caring touches my heart. For Teacher Day, while students are looking for teacher thank you poems, perhaps teachers might like this rhyming poem as a teacher message to students at the end of the year, to give to their best and brightest, or even to the whole class. Teacher appreciation poems should include poems for teachers who are retiring. This teacher poem is a teacher retirement poem. You can use this teacher retirement poem with a card or gift. Teacher retirement poems are in great demand. This teacher appreciation poem should linger long in the mind of the retiree. with the pleasure of seeing you. that we could never replace. Teacher poems can be for students of different ages. Just as I designed "Sonnet For An Unforgettable Teacher" for advanced high school or college level students as a poem for teacher, I also wrote poems from child to teacher. I tried to write this kid poem for teacher for the youngest students—a kindergarten teacher poem, for example. Here's the result: a poem for the preschool teacher. For little kids, it has to be a rhyming poem, of course. Poems for teachers that are written for young children are very popular. These Teacher Day poems and wishes can be used by kids on cards or with gifts. Poems for teachers must include short poems from little kids. These short teacher poems from preschool and kindergarten kids will fit on a little card. Here's another teacher poem for a younger child, a Teacher Day message. It's suitable for an end of the year poem for teacher or a goodbye poem for teacher. Many thousands of people are typing teacher prayer into their search box, so I wrote a free verse teacher poem to be used as a teacher prayer or teacher appreciation saying. Here it is. There are more than 800 poems at this site! Why Your Teacher Is The Best! Don't just think it; post your praise and give your teacher a card with a link to your page. Give examples of what your teacher has said, done and taught you that makes him or her extraordinary. Your teacher will love reading why you think he or she is special. Entering your words for teacher is easy to do. Just type! Your message will appear on a Web page exactly the way you enter it here. You can wrap a word in square brackets to make it appear bold. For example [my teacher note] would show as my teacher note on the Web page containing your story.